Amazon is upping its game in the color tablet market. Last year, it launched the 7-inch Kindle Fire, a pretty good, but limited, device mostly distinguished by its low price of $199 and its seamless access to Amazon’s massive ecosystem of e-books, music, videos and periodicals. Now, Amazon has come up with a successor, the Kindle Fire HD, which comes in two screen sizes, 7 inches and 8.9 inches (the iPad’s screen is 9.7 inches, by comparison). Again, I see the key advantages of these new Fires as low base prices and easy access to Amazon’s content offerings. The 7-inch model, while beefed up, still starts at $199 and the larger version at $299. By contrast, the latest iPad starts at $499, though the older iPad 2 is still available at $399. The new 7-inch Kindle, which ships on Friday, is much improved from the original Fire and has new features. For starters, its base model has 16 gigabytes of storage, double that of the original Fire or the base Nexus 7, and equal to the base iPad. It is slimmer, lighter and more stylish than its predecessor. It now boasts a high-definition screen, dual speakers, a faster processor and far better battery life. The Kindle Fire HD has a carousel displaying recently used apps and contents and a horizontal menu of categories across the top. The Fire HD also assaults users with ads occupying the entire screen every time they start or resume using it. You have to pay Amazon another $15, using an obscure setting on a Web page, to escape these ads. And there are pitches to buy more content on many other screens, even those displaying your already-purchased content. I didn’t test the 8.9-inch version, costing up to $599 with fast cellular-data connectivity and maximum memory. It won’t be available until Nov. 20. Like the Nexus, but unlike the iPad, the 7-inch model can’t operate on a cellular-data network and relies on Wi-Fi only. The main user interface has changed. Instead of a series of faux shelves displaying recently used apps and content, there is now a carousel, a scrolling horizontal array of these items. Across the top is a horizontal menu of categories, like Games, Apps, Books, Music, Videos and so forth. Like all 7-inch tablets, the new Fire has less than half the screen real estate of an iPad, but is easier to hold in one hand, or to tuck into a purse or large pocket. I found the screen to be crisp, clear and vivid, though inferior to the superb Retina display on the current iPad. Its resolution is the same as that of the Nexus 7. It also is about the same thickness as the Nexus, though a bit heavier. It is much lighter than the larger iPad, but about 10% thicker. I found its speakers far better than those on the iPad and Nexus. Like the original Fire, the Fire HD is technically an Android tablet. It uses last year’s version of Android, Google’s mobile operating system, while the Nexus uses a newer, more polished version. But, like its predecessor, the new Fire buries Android, demoting it to mere plumbing. It doesn’t use Google’s user interface, or the standard Google apps, like Google Maps or a special Gmail app, found on other Android devices. Instead of the standard Google Play store for apps and content, it has its own. Most Android apps aren’t available there. The Fire is really a hardware entry point to Amazon’s massive, unmatched selection of books and other content. 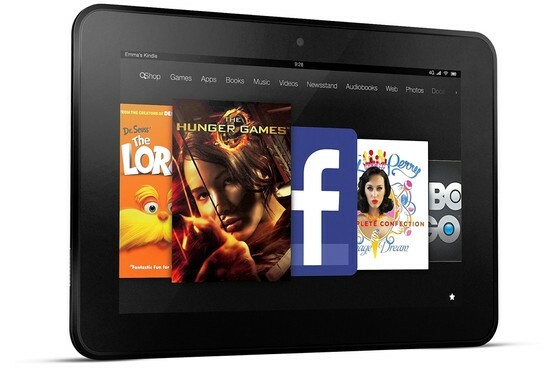 Amazon CEO Jeff Bezos introduced the Fire HD saying it shouldn’t be thought of as a gadget. “The Kindle Fire is a service,” he said. That may sound strange because Amazon makes apps for its competitors that can access the content it offers. For instance, iPad owners can get free apps from Amazon for Kindle books, Amazon video and music. But this content, and especially the ability to quickly buy it, is much better integrated into the Fire. The Fire has some content capabilities that aren’t present in Amazon’s iPad apps. Among these are the ability to lend certain books; a feature called “Immersion Reading,” which lets you listen to a professional audio narration of a book (for an added price) as you read along; and a feature called “X-Ray,” which quickly displays all the characters in a book or all the actors in a movie. Amazon claims the new Fire has advanced Wi-Fi technology that is faster than the Wi-Fi on the iPad. But in my tests, I couldn’t replicate that. Most Web pages I tried loaded slightly faster on the iPad. And, using two different speed test utilities on two different networks, I found the iPad was a bit faster in almost every instance, occasionally much faster. The Fire HD lacks some features the costlier iPad offers. Among these are a rear camera, and built-in dictation, instant messaging and maps, and the ability to beam video or music to a TV using a device like the Apple TV. It lacks artificial-intelligence features like Apple’s Siri, or Google Now, a feature of the Nexus 7. Amazon’s app store has about 30,000 apps, versus more than 500,000 for the iPad or Nexus. In my harsh battery test, where I set the screen at 75% brightness, leave on the Wi-Fi to collect email in the background, and play videos back to back, the Fire HD was respectable, if not up to its claim of 11 hours, or as good as its competitors. It lasted nine hours and 28 minutes, compared with just five hours and 47 minutes for the original Fire. That was about half an hour less than the iPad, but over an hour less than the Nexus. Overall, I see the 7-inch Fire HD as a good value for those primarily interested in easily tapping Amazon’s large collection of content.